An update on this topsy-turvy springtime. 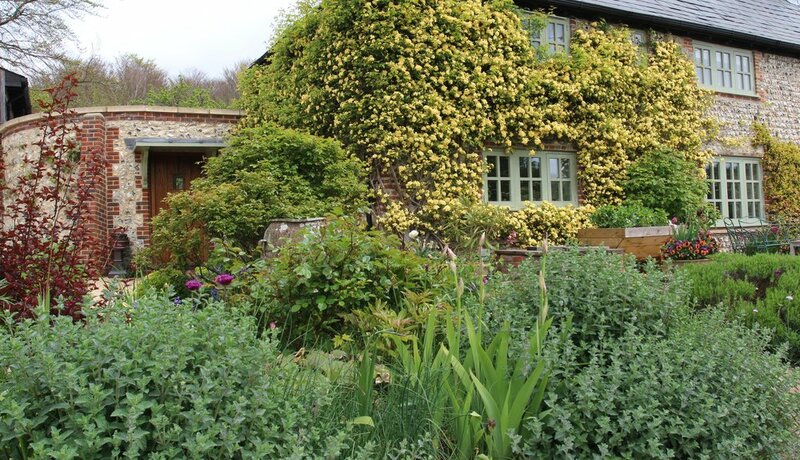 This photo of The Long House was taken on May 4th and shows the rosa banksiae Lutea fully out and looking quite spectacular (and I have to admit much admired by walkers coming along the South Downs Way). But it’s premature! When we first saw the house, on June 4th 2010, it looked identically splendid but that was then and then is now…30 days ahead of schedule. What is particularly frustrating is that we were banking on it being at its peak on May 28th when we’ve a large party of Austrians coming here on a garden visit (complete with camera crew and led by Austria’s answer to Alan Titchmarsh). Irises are also flowering now and they’ll be over too by then. 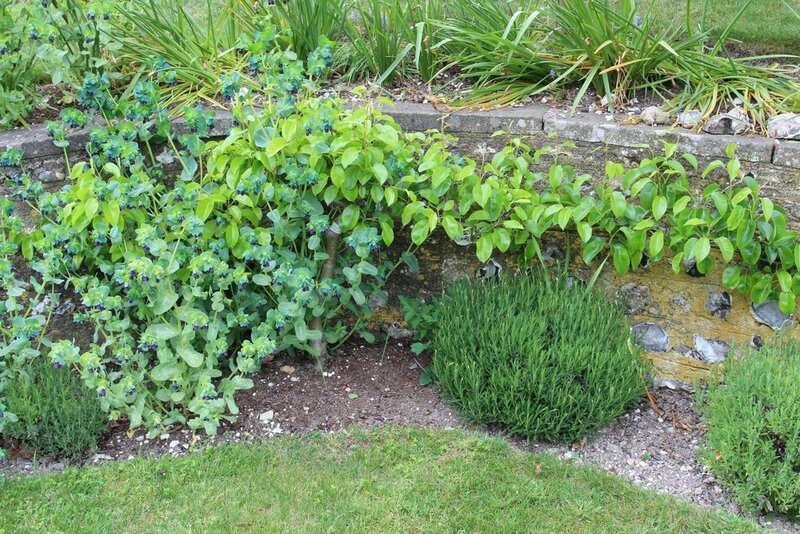 That’s not all: Rosie’s doing her Chelsea Chop now, three weeks ahead of the show actually taking place, yet, on the other hand the broad beans have stagnated since those damn frosts and the cotinus Grace in the shrubbery is suffering from frigidity (poor dear). So there’s no pleasing anyone this year. Least of all the poor wine growers of England: Nyetimber, Denbies, Ridgeview and Rathfinny have all reported ‘catastrophic’ damage to their vines because of those two nights of recent air frosts. So who am I to complain when we just garden for fun. Still on the subject of frost damage it was (marginally) interesting to see the effect of shelter on blossom: below are three pictures of one of our step-over pear trees: the left hand one shows the whole tree partly submerged between a cerinthe seedling, the middle picture shows the effect of the protection it gave from the frost and the right hand picture shows the total lack of fruit where it was unprotected. With luck the poor tree will divert all its energies into the remaining pears so that they become whoppers. And then the damn fox will come along and snaffle them, just like it did last year. You can’t win. You may be equally uninterested by the origins of ‘topsy-turvy’: topsy is obviously an allusion to ‘top’ but turvy is less clear. ‘Tirve’ is a medieval word meaning ‘to turn or topple over’ but ‘turvy’ could also refer to ‘turf’, so that topsy-turvy could mean ‘with one’s head on the turf’. An early literary reference is from Richard Eden’s 1555 volume The Decades of the New Worlde: ‘They say that they see the houses turne topsy turuye, and men to walke with theyr heeles vpwarde’. So that proves almost nothing. Just like the weather. Newer PostThe miracle of May (not Theresa). Older PostUps and downs (and the meaning of life).